Santa Maria del Bagno (Santa Maia al Bagno) was the largest DP camp in southern Italy. Established in 1943, the camp housed 2,300 Jewish refugees at its peak in early 1946. The exclusively Jewish camp was dispersed over three sites in requisitioned villas in the fishing village of di Bagni. 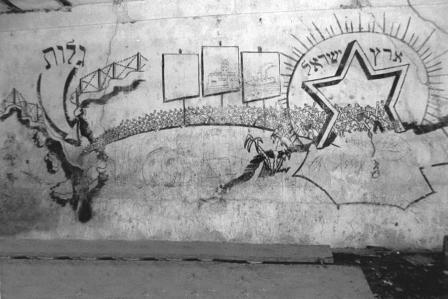 Like other DP camps in southern Italy, di Bagni received an influx of Jewish refugees after the UNRRA dissolved the illegal “Betar” group kibbutz, and introduced a highly organized and politically active subpopulation into the camp. Di Bagni’s population rose from 771 in March 1945, to 2,277 by January 1946, making it the most influential of the southern Italian DP camps. The camp s erved as the administrative center for many illicit Israeli immigration schemes and, on April 11, 1946, the camp committee organized a 2,000-person hunger strike in protest of British limitations on immigration to Palestine. “It is the foundation of rights of humanity for everybody to have the possibility and the right to return home,” the di Bagni committee wrote to British authorities. The camp committee disseminated information to DPs by posting a weekly World Bulletin, culled from American and British radio news, that was distributed among the four southern Italian camps.